Kyuhyun had to leave ‘Mamma Mia’ after a fall reshuffling by KBS as the show was shifted to Wednesday night, which is the same time slot as ‘Radio Star’ where he’s currently appearing. 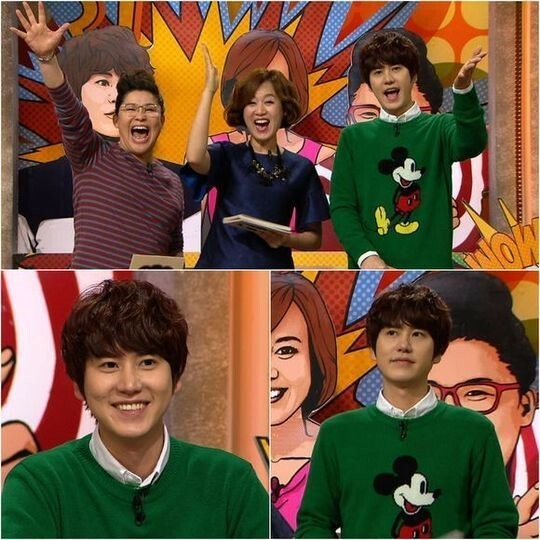 Lee Young Ja also teased Kyuhyun saying that he should ditch ‘Radio Star’ for ‘Mamma Mia’ instead, but Kyuhyun said, “I was there for two years, so I can’t because of loyalty.” This is such a testament to Kyuhyun’s work ethic and gratitude and it says a lot about him as a character, as many fans will agree. Although he will be missed on the show Mamma Mia, he will still be seen on Radio Star so there is no need to fret! It was a bittersweet goodbye for Super Junior singer Cho Kyuhyun, as the 25-year-old star filmed his last episode of the South Korean variety show “Mamma Mia” on Friday night. Kyuhyun’s final appearance on “Mamma Mia” will be broadcast on Sunday. The Super Junior told the director of “Mamma Mia” that he didn’t blame him for the change, since it was clearly an executive decision. When Lee suggested that Kyuhyun blow off his commitment to “Radio Star” to remain on the show, the singer’s answer was simple: he’s been there longer. “I’ve been there for two years. I can’t [leave ‘Radio Star’] because of loyalty,” Kyuhyun said. One member of the production crew reflected for the KBS cameras about what a fun experience it was having the Super Junior superstar on the show. And the Super Junior singer could be jumping ship just in the nick of time, as the future for “Mamma Mia” remains uncertain. Back in August, KBS execs announced that the show would be cancelled, they just weren’t sure exactly when. “Mamma Mia’ will be cancelled” a network exec told the website allkpop. Kyuhyun’s final appearance on “Mamma Mia” will be broadcast on Sunday. Next week, the show will begin airing in its new timeslot on Wednesday nights. He will be leaving the program after the 27th broadcast. As ‘Mamma Mia’ swifts time to Wednesday 11PM, they will be fighting against Kyuhyun’s MBC ‘Radio Star’. Kyuhyun slur the end of his sentences, “I have been there for 2 years…I have loyalty…” and made everyone laugh. Huh Kyung-hwan will be replacing Kyuhyun. Therefore, Park Mi-sun, Lee Young-ja and Huh Kyung-hwan will be hosting ‘Mamma Mia’. The first host Min-ho quit the job due to SHINee’s Japan tour concert and Kyu-hyun replaced him from the May 19 episode. He is appealing to viewers with humorous ad-libs and staright0fowrad comments. ‘Mamma Mia’ will be aired at 11:10 pm on Wednesdays, not at 4:55 pm on Sundays, due to the program reorganization of the fall season. During the changed time, competitors’ popular shows such as MBC ‘Radio Star’ and SBS ‘Pair’ are aired. ‘Mamma Mia’ will inevitably compete with these programs. 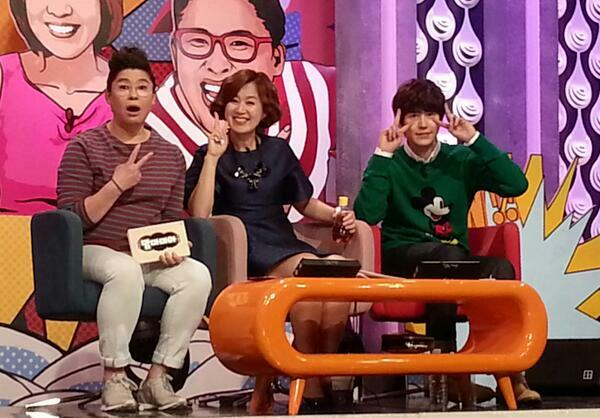 Then Kyu-hyun will appear on ‘Radio Star’ and ‘Mamma Mia’ at the same time. Therefore, he will need to make a decision as soon as possible.